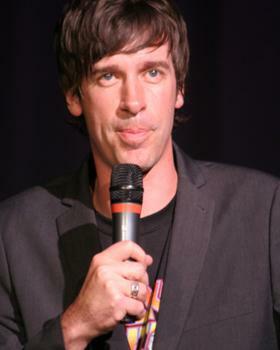 Matthew Hardy is a Melbourne-based comedian and comedy writer who was the first Australian to cement himself full-time on the UK live circuit, spending eight years there in the 1990s, including regular appearances at Jongleurs and The Comedy Store in Leicester Square. A regular at many international stand-up comedy events, he is the author of Saturday Afternoon Fever, which became the basis for three seasons of a one-man show adaptation at the Melbourne International Comedy Festival. Hardy also appeared in the Festival with his own take on Charlie and the Chocolate Factory, along with special guest Julie Dawn Cole, who portrayed Veruca Salt in the 1971 film version. Hardy's TV credits include hosting two series of The Big Schmooze, Foxtel's only Tonight Show on The Comedy Channel and appearing as a panelist and roving reporter on ABC-TV's The Fat. He was part of the BAFTA-winning The Sketch Show writing team for ITV in the UK, and subsequently wrote for Kelsey Grammer's sketch series on FOX in the US. He has also appeared as a panelist on ABC TV's 'Spicks & Specks', and on Network Ten's 'Good News Week'. In 2009, he was the UK correspondent during the SBS 'live' ASHES cricket broadcasts. In 2008 Hardy's debut DVD/CD was released, titled 'I'm So Australian', a view on what it takes to be Australian. In the UK, Hardy toured with Irish comedian Ed Byrne for 25 gigs in the Scottish Highlands in 2010. In the same year, he wrote for The Stephen K Amos Show on BBC One and co-wrote the BBC Radio 4 series, Shappi Talk.